Bo01 is the first big demonstration of what things look like with the Swedish Building standards officially abandoned. It's hard to write about the architecture of Bo01 in Malmö without somehow acknowledging something of the social and political factors in the background. "Excuses, excuses" I can hear them yelling in from the gallery of Danish architecture but if you will allow me to indulge, I will try to give some kind of personal view as a foreigner in Sweden, trying to make sense of this event. If you were to judge Bo01 by what was written in the Swedish press, especially the local newspaper, you would see it as a unmitigated disaster. They should have interviewed my parents who came over from Scotland in May and were so impressed by Bo01 that they decided to come back and see it again before it closed. And my mother was even impressed with the prices - such nice flats and so reasonably priced. When I tell Swedes this they laugh in disbelief - because they see the flats in Bo01 as ridiculously overpriced and generally badly designed. Compared with what's gone on before in Sweden they may have a point. Compared with the housing stock in the rest of Europe right now I find my parents surprisingly perceptive. But this is the decidedly Swedish story of Bo01, demonstrating some of the growing pains of European Union membership with all that involves. For the first time housing is being built, sold and rented at market prices. At the same time Bo 01 is the first big demonstration of what things look like with the Swedish Building standards officially abandoned. Malmö is Sweden´s third city - and has a bit of chip on its shoulder as the youngest brother. With the opening of the Öresund Bridge there is now the risk of the city becoming a mere suburb to Copenhagen. In this situation, size matters and Malmö already boasts Sweden´s widest street and largest square, the biggest municipal theatre, and has planned the largest university building and the tallest tower in Scandinavia. It is therefore no surprise that the town should wish to host the largest housing exhibition since the legendary "Stockholm Exhibition" of 1930. Bo01 was a 4 month mega-event, loaded with prestige as it coincided with Sweden´s first presidency of the European Union. The Housing Exhibition is a regular event in the Swedish architectural calendar - most recently and with considerable success in 1999 in Helsingborg. Here Vandkunsten´s albeit watered-down master plan set the scene for not only a successful conversion of the former port into an attractive and sought-after waterfront district but also a highly popular summer event. The idea was to repeat the success only bigger, better and faster. 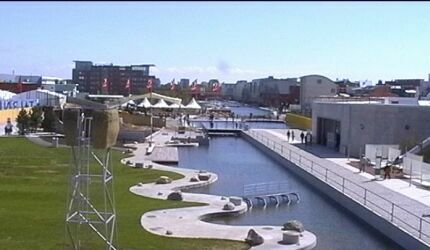 Market forces moved the more village-like Bo00 from Limhamn to the urban dockland site in Malmö´s former industrial harbour. The Swedish building industry was determined to prove they could produce Bo01 in record time and as someone said we´ve done this before referring to the (in)famous Miljonprogrammet, which saw the construction of one million homes in 10 years. Bo01 was to be a forum for urbanism and architecture, interiors and design, landscape and art. The temporary art exhibitions with installations by renowned artists were somehow overwhelmed by the architectural parts. I suspect that if Sarah Sze´s installation, for example, had been at Rooseum or Louisiana the interest would have been much greater. 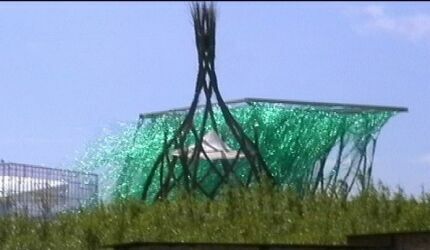 The landscape installations in varying degrees of permanence, deserve some comment and I would include the over-the-top, huge tinsel tree "Weeping Willow" by Martha Schwartz and Lionel Bouvier´s Potagier Urbain with its graffiti and recycled oil drums. Kamil A. Lukaszewic Released Cages was a poetic surprise and Adriaan Geuze´s "Mikado" was landmark for the whole exhibition. But perhaps what is of greatest interest for the architect are the permanent parts of BoO1 - and I feel for this there are two levels of examination. Firstly the urban intention - Klas Tham´s plan - and the architectural intention of the individual flats and houses. The urban plan is clearly of its time - a perfect example for the EU Green Paper on the Urban Environment. On an extremely exposed site, a micro climate is created by the taller wall of tenement buildings (on average 5-6 storeys) which protects the lower inner areas of 2-3 storey houses from the strong winds blowing down the Sound. The change in scale also helps to establish a natural hierarchy of urban space - from the big scale of avenues and promenades to the side lanes and small squares. There is a clear structure of fronts with entrances onto hard-surfaced public spaced backs with backdoors into carefully planted gardens. view. The urban intention overlaps into the different buildings, demonstrating a functional robustness by including 3m high ceiling height on the ground floor of all the tenement buildings to allow commercial functions to move in. Perhaps the most significant aspect of the whole exhibition is the concept of dividing the already small urban blocks into individual plots and developing each of these plots by a different designer. This creates an architectural diversity perhaps never previously seen in a contemporary urban development. After the initial impressiveness of the variety of architecture, a closer examination is somewhat more disappointing. The architectural intention is obviously as diverse as the architects of the different buildings. In flat after flat we see Swedish architects trying to loosen up. The freedom from the old standards along with the generous budgets (based on wealth of the anticipated occupants) has generated an often shockingly banal result. Constraint would seem to be an underestimated factor in the creative process. areas, high ceilings and big windows? Stockholm-based Ajö Tristess tried to be provocative with their bright orange rubber flooring, double ceiling height and lack of internal walls (creating effectively a one room flat of 180m2). If I was a Malmö millionaire I would deem it an unconvincing purchase. staircase, re-positioned nearer the front door would have given much more useful area, saving on communication area (crossing the living room) and given at least the possibility of an extra room (guest room, work room, whatever) upstairs. Most of my colleagues, as well as friends outside the profession, agreed that they would most like to move into "Seniorgården" by Arkitekt Magasinet. Unfortunately the flats have a lower age limit of 55 years. The assumption is interesting that well-proportioned rooms, thoughtful detailing and taking care of the practical business of cooking, storage and laundry are reserved for old-age pensioners! The best elevations have to be on Gert Wingårdh´s building. From the inside, the windows in his waterfront duplex are a celebration of water - filling the flat with blue reflected light. White´s terraced house everyday luxury presented a convincing family home of generous proportions and thoughtful detailing. The interior decoration of the show house was perhaps slightly over-enthusiastic but the load of recycled Danish classic furnishings helped the house live up to the title. 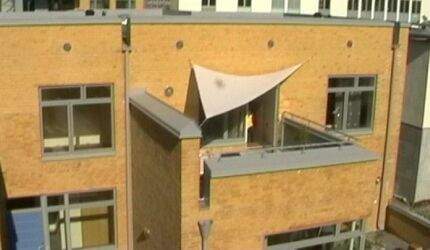 The best new detail had to be the tall fold-away doors in Gregor Dahlström´s waterfront penthouse - a detail which we can hope will be recycled elsewhere. The bookshelf for paperbacks in "Town house" is a wonderful little piece - an expected functional sculpture. Best piece of furniture for me was Jonas Lindvall´s narrow but very long dining table Oak. Previously presented at "H´99", Oak has undergone a something of a biological metamorphosis and is now available in ash. This long, blond Scandinavian beauty is a wonderfully social piece of furniture, its narrowness affording dinner guests intimacy and no one seems to get a leg. The interior which surrounds the piece creates a haven of calm - convincingly well-detailed in contrast to other perhaps more hasty detailing found elsewhere. Finally I have to mention second-year architecture student Johan Annerhed who presented a fresh approach to interior design including his dining table with built-in fish tank - to take care of those irritating breadcrumbs. What is the point of having an event like Bo01? The level of sophistication in our everyday lives means we can never recreate the excitement of the 1930 "Stockholm Exhibition". As recent Expos have demonstrated the modern public is hard to impress and it is more and more difficult to come with new, spectacular experiences. Bo01 might not have scaled the cultural heights, however the diversity of the architectural offerings did at least offer something for everyone - and that is surely what every district of a city should do. At the end of the day, Bo01 worked for me. Looking out onto the Sound from Wingårdh´s windows it suddenly made me realise that living in Malmö was suddenly an attractive proposition - my perceptions had been changed.